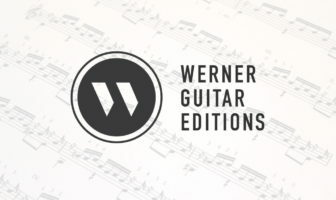 Review originally posted on Classical Guitar Canada (2010). Before I begin the review I’d like to congratulate Dr. Desrosby on his new teaching position at Sherbrooke University next year and for becoming an official Savarez Artist! As soon as the Giuliani began playing I could tell Desrosby was both a strong and controlled player. The musical lines sound direct and are played with solid contact in the right hand. What I didn’t expect after this first impression was the boost in energy and virtuosity that would follow. Desrosby’s strength lies within this ability to dig in and produce solid tone, even when the virtuosity increases. Another aspect of the Rossiniane that I enjoyed was the pacing and relaxation between the contrasting sections and the material that links those sections. He’s not afraid to create spacious time when the music deserves it. The Torroba is great! I mean, I’m a bit sick of this work but Desrosby kept my interest the entire time. There is a lot more of his expressive qualities in this repertoire including some beautifully placed vibrato. Again, some very nice and spacious pacing in the Andante with a variety of colour and appropriate balancing of the voices. He ends the Torroba with an exciting and quick Allegro. The strings might get pushed a bit too far on the repeated figure as there is some slap noise but I never mind guitarist’s that push the instrument that extra mile. The Sasseville-Quoquochi Totems is certainly the most interesting repertoire on the recording. I’ve only just started hearing Pascal Sasseville-Quoquochi’s works but I’m convinced that his music is a good contribution to the classical guitar repertoire. The music is well composed but also effectively uses the guitar to its maximum capacity. The textures climb and climb in the movement Eagle and the rasgueado texture is a great climax to the movement; not just a cliche Spanish trick. The Wolf movement delivers some interesting lines and textures, sometimes earthy, sometimes equaling the energy of a rock band – move aside Hetfield! The movement continues to build from a ostinato figure into an expansive landscape again showing Desrosby excellent musical pacing. The Totems are a great Canadian work inspired from the Atikamekw culture. Conclusion: Desrosby has exceed my expectations and confirmed that Canada has a new level of upcoming high quality artists. 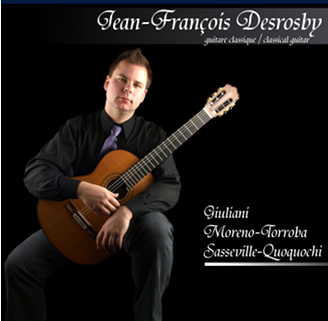 Buy the recording for the Sasseville-Quoquochi Totems but also enjoy the Giuliani and Torroba on the way! I look forward to hearing more from Desrosby and highly await his next recording.